I've got the base colors down. When I was painting him the other night, I was really worried about how he was going to turn out. Now that I come back to him a day later, he doesn't look that bad and I think he's going to turn out fine. Here's what he looks like next to a regular jetbike. Once I get him finished, I'll post more pics. He looks good so far - the black does a good job of making him stand out. Have you thought about different striping patterns? The paint job looks good, however what are you going to do to differentiate him from a shining spear exarch with power weapon? I think adding in some of the details of a traditional warlock would go a long way. Spear, custom helmet (with horns, custom symbol, or tassels), also the distinctive chest armor(even if the design is painted on). Sticks to theme yet stands out. Perfect! I'd be curious to see him with the back of the bike painted black rather than red. (Maybe have the wings red and teh engines black? ) Should be an interesting paint job when it's done. I have to agree with Blaise I'm curious how the bike would look with the wings black. It would make it fit better I believe. It now looks like the canapé is separate from the rest of the bike. Looks good. I'm amazed at how straight those lines are. I can't draw a straight line with a ruler, let alone paint one! I thought about different striping patterns but I've decided to keep them all the same across the board. A way to unify them visually. As for more details on him, I don't know, I don't have anything else to add to him. 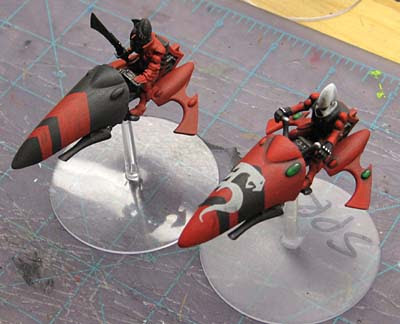 I have been tossing around the thought of striping the back part of the jetbike somehow. I'll need to get him finished first and then play around with some ideas in Photoshop to see what the results would be like before painting anything. I'll be sure to post some variations for you guys to check out and toss in your two cents. Last night, I managed to finish the basecoats get him shaded. Tonight I'm going to try and get the highlights done.